The other day a friend on Facebook posted the Faces of Change video about how the ACA has helped save the life and future of a former critic of health care reform. Darned if someone didn’t come along and add a condescending comment about the lack of single payer in the ACA. I guess I shouldn’t have been surprised by that, but in my universe there are so many benefits to this law that I’d forgotten about that tired complaint. Single payer is the room already being blue. The Far Lefties love the idea of single payer, they really do, but they refuse to see how the field needed to be prepared to make single payer even a viable option. Plus they refuse to see how there is more to health care in general and reform in specific than just how patients pay for the care they receive. The ACA does so much more than just provide coverage. The ACA tackles the foundation of how health care is delivered, too. A case in point is mandating that anyone providing care to Medicare recipients must convert their records from paper to digital. My eye surgeon’s office is in the middle of this transition right now. They have had to remodel their entire office, in particular their exam rooms to accommodate computers and monitors. Plus they had to pay for expensive software to be installed on their new systems. The staff and doctors have to receive training on this system and they will have to contract for IT support, too. Not only will this make it easier in the long run for their patients to get good care, but it will also make it easier for the surgeons to interface with the co-providers (Optometrists and Ophthalmologists) who do follow up for their patients. Added bonus: jobs. Health IT is one of the fastest growing fields in America right now. Anyone who has been able to log in to their health care provider’s system to get test results can attest to how much better digital records are than paper in this modern age. I, for one, am glad single payer wasn’t part of this law. We need to fix so much of what is wrong with health care in areas like fraud and basing payments on procedures rather than outcome. Once health care is set on a trajectory of accountability and outcomes and with a new paradigm of wellness and prevention, THEN we can talk about how to provide care using a single payer system. Then the room really will be blue. Another example of how the ground needed to be prepared before change could occur was the repeal of Don’t Ask, Don’t Tell. The Far Left wanted the President to just sign an Executive Order and be done with it, not really grasping that Executive Orders can be rescinded by a subsequent Administration, which could undo all the benefits of said Order. The President knew that wasn’t going to fly and that he needed to establish himself as Commander-In-Chief with the military before he could act in any fashion to make changes to the way they conducted their business. He smartly had the military perform a study of the issue, get input from the troops and devise a way to implement the changes once the law was repealed. Time and care were taken to prepare the military for the changes. The people actually running the military were consulted; their opinions were listened to with respect. The President allowed the military to do what it was already prepared to do without ‘ordering’ them to do it. Then he did some nifty horse trading to get the law repealed by extending the Bush tax cuts two more years at a time when the economy could not withstand a tax hike. I believe it helps us to know that the way the Far Left thinks about issues has at its core a primal thought process that mirrors the male brain at its most basic. See the hill. Take the hill. There actually is a biological imperative for this kind of non-strategic thinking. Any aggressive behavior conducted by humans requires a shortcut in thinking. If we had to strategize before we took every action, humans would never hunt for their prey because they’d become paralyzed by fear. Males wouldn’t pursue females for procreation; fighting battles either to conquer or defend would never happen. The willingness to charge into battle, defying the fear of loss of limb or life is a hallmark of mankind. Basic survival depends on the ability to plunge headlong into danger without regard for the consequences. But change and progress require the ability to use the strategic part of the brain. Hunting in packs requires strategy and planning. Going from simply gathering food to planning ahead to grow food and exploit crops requires strategy and planning. We need both kinds of thinking to get by as humans. I want the person who is willing to defy danger to save people from floods and fire; first responders need the see the hill, take the hill mentality to do their jobs. What I don’t want is to apply that same mindset to the creation of policy and problem solving in areas of economics, education, social justice, etc. I want the strategic thinkers on that job. The Perp Walk. We all remember the Far Left demanding that Bush and Cheney be arrested and tried for war crimes. I also remember that candidate Obama said repeatedly that he wasn’t going to re-litigate the past. That we needed to move forward and tackle the immediate problems of the moment. He did just that and now we see the result: Bush and Cheney are virtually under house arrest without him having to lift a finger. Plus moderate Republicans are more willing to support the President now because he didn’t blame anyone for the mess he inherited; he rolled up his sleeves and got to work solving problems. That bought a lot of good will for his policies with average people. Nationalize the Banks. I’m no economist but it has become fairly obvious that the strategy of bailing out the banks, while wildly unpopular, still worked. There are a few banks that still fail the stress test, but the banking industry hasn’t had to undergo any major upheaval, and nationalizing them would have been a massive undertaking that wasn’t guaranteed to succeed and would have likely caused a tsunami-sized backlash from the Right that made their protest over health care reform look like a Sunday picnic. He Should Come to Wisconsin. It really was not all that long ago that the Far Left, in all their wisdom, was clambering for the President to make an appearance in Wisconsin during the height of the protests there. The President didn’t want the focus of the fight there to shift to him so he prudently stayed out of the whole affair. Now dates have been set for a primary and recall election. The people of Wisconsin own every bit of the success there. There is now sufficient evidence that the tactics advocated by the Far Left in the media are unsound and only serve to distract and create chaos. Their tactics bear no resemblance to governing; in that respect the Far Left has more in common with the Tea Party than with Democrats. They see a hill and want the President to take that hill for them. They don’t see the way the ground needs to be prepared, and they don’t see the hidden or even the obvious dangers inherent in taking that hill. Or even that they’re looking at the wrong hill. They get fixated on their hill and simply cannot tolerate anyone disagreeing with their goals. 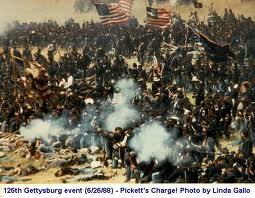 They wanted Pickett’s Charge and they got Sun Tzu. And it drives them crazy. Just for fun, let’s look at how various factions of the Far Left would go about painting our symbolic room. The Anarchist will tell us that they don’t want the room painted blue simply because we want it painted. Then they’ll sneak in when we’re not home with buckets of midnight blue paint and start hurling the liquid at the walls. They’ll ruin the furniture, pictures, drapes and carpet in the process, but the room will be blue. The Libertarian will tell us that we have no right to tell them that rooms need to be painted in the first place. But if we want our room painted blue, then we better pay for all the supplies and paint it ourselves. Then they’ll make a big show of NOT painting their own rooms. Ever. Because they don’t have to if they don’t feel like it. The Occupier will discuss endlessly the merits of painting rooms, then form working groups to discuss the effects of the color blue on people. Once there seems to be a real effort on our part to paint that room, they will sit down in front of the door to the paint store to prevent us from purchasing the paint because the paint manufacturers are corporate entities. The Greens will just lecture us on the toxic qualities of paint and the dangers of the fumes and what happens to paint downstream when we wash it down the drain while cleaning the brushes and rollers. Ideally I would like to believe that the Big Tent philosophy allows Democrats plenty of room for all the extremists on the Left. The reality is that while these people are our friends and they do sometimes contribute and there is crossover in our belief systems; I’m not convinced that their policies and tactics can be taken seriously by anyone who wants to implement real change in this country. See the Hill—Take the Hill and good governance are mutually exclusive. Our President has shown us this repeatedly. I volunteered to elect Barack Obama as our 44th President because I wanted someone who knew how to get stuff done. He has demonstrated unflinchingly and with great respect that getting stuff done means attending to all the little details and doing all the preparation is the key to lasting change. From now on, we can simply ignore the policies and tactics of the Far Left as outdated and deeply flawed. We have been shown a new way to proceed. President Obama has provided us with a living blueprint for change and progress in this country. We can refer to his strategies and paradigm-shifting policies in areas like Foreign Affairs for many years to come for guidance on how to effectively create progress.